Author John Smelcer at the summit of Mt. Sanford, Alaska. Photo taken by his brother. 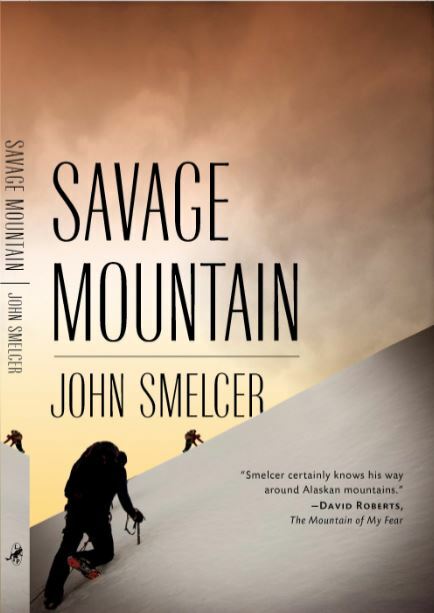 John Smelcer’s 50th book just came out this summer. 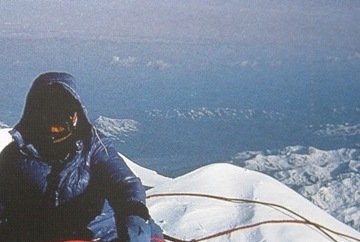 “Savage Mountain” is a mountaineering novel set in 1980. It’s the story of two teenage brothers, Sebastian and James Savage, who climb Alaska’s 16,000 foot Mt. Sanford…alone. But it’s much more than the story of conquering a mountain. Inspired by true events, “Savage Mountain” is the unforgettable story of two brothers trying to conquer their fears and doubts and frustrations. In this scene, the boys have successfully summited and are on their way back down. Smelcer is a contributing editor at Ragazine.CC. By John Smelcer Before setting out, the boys studied the route down the mountain. The knife-edged ridge line they had traversed several days earlier was buried in snow and drifts, making the descent ten times more difficult than their ascent. Blanketed as it was, with heavy overhangs, it would be nearly impossible to discern the topography underneath. One misstep could spell disaster. The 3,000-foot fall on either side would be deadly. Below the ridge, the boys could see the wide glacier, its crevasses concealed more than ever. “Boy, this could be bad,” said James, adjusting his goggles. “Hey, look at the bright side,” Sebastian replied happily. “Yeah? What’s that?” “We still have the package of chili mac.” “Oh, joy,” replied James, rolling his eyes. The brothers played it safe, long-roping their way down the ridge. James took point, leading the descent about a hundred feet ahead of Sebastian, dragging fifty feet of slack rope behind him. The blasting winds had sculpted the overhangs so that the crest of the thick-snowed ridge was extremely precarious. Sometimes, chunks of packed snow the size of a car broke away beneath James’s feet and hurtled down the 3,000-foot vertical cliff face. Sebastian was careful to step in his brother’s footprints, thinking that if James had made it safely, then he should as well. The two tiny specks had worked their way down the ridge for an hour when, suddenly, Sebastian heard a scream. He looked up just in time to see James vanish off the north side of the mountain. The slack rope between them reeled rapidly forward. In an instant, Sebastian knew what had happened. The snow had given away, and James had plummeted off the cliff face. In a second, the rope would be pulled taut and yank Sebastian off the mountain as well. The brothers would perish together at the base of the cliff, more than two thousand feet below. Straight away, Sebastian launched himself into thin air off the south side of the ridge, praying that the rope would hold. With a jarring jolt Sebastian’s free fall was arrested, and he was slammed against the rock face. The impact hurt his right shoulder. Snow and ice from above avalanched down on him. Sebastian hung motionless at first, forcing his mind to stay conscious and taking stock of his situation. The fact that he wasn’t falling meant that James was still connected to the other side, a counterweight. But he didn’t know if his brother was still alive or dead. 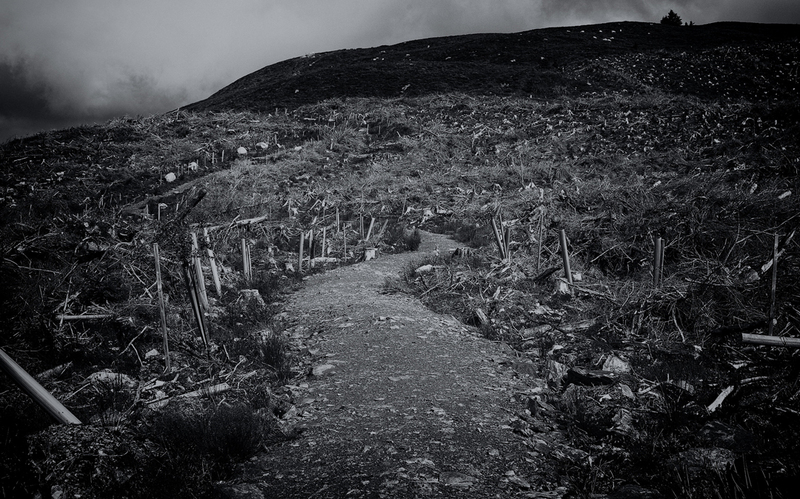 Sebastian shouted, but the wall of mountain between them blocked any communication. Sebastian wasn’t sure what to do. He couldn’t just climb back up to the top. Once he stood on the crest, his brother’s weight would pull him off the north side of the mountain. He certainly couldn’t cut the rope. Sebastian slowly formed a plan and began climbing toward the top of the crest. When he was close, he hammered a piton into the rock face and connected himself to it with a carabiner and a short piece of rope; anchored that way, he couldn’t be dragged off the other side. Fortunately, when Sebastian scrambled onto the snow-thick ridge, he saw James just climbing over the north side less than a hundred feet below him. He cupped his hand around his mouth and shouted to his brother. “You okay?” James gave a thumbs-up with his gloved hand. Sebastian responded with the hand signal that meant hold up. He disconnected himself from the anchored rope and worked his way down, careful to step in his brother’s footprints. James’s nose was streaming blood, running down his chin, bright red drops dripping on the pristine snow. “I think I busted my nose,” James announced when they were standing side by side. Sebastian removed his pack and dug out what looked like a dark blue hand cloth. “Here, use this to stop the bleeding,” he said. James took the wadded up cloth and pressed it against his bloody face. “Holy smokes! That was scary! I thought we were dead,” Sebastian declared with a smile and sigh of relief. “Remind me never to do that again!” “I think I crapped myself!” James muffled through the cloth. “I can’t believe we survived that,” Sebastian laughed lightheartedly, while looking over the precipice. “That was pretty smart thinking . . . jumping off the other side like that,” said James. The brothers slapped a high-five. “I saw my life flash before my eyes,” said James. “I can’t wait to get off this damn mountain.” “I’m sure glad there was some slack in the line,” said Sebastian. “Otherwise, we’d both be dead by now.” After a couple minutes, James removed the blue cloth to see if his nose was still bleeding. A puzzled expression came over his face as he unwadded it. “Wha . . . What the hell?” he exclaimed in horror. “Dude! This is your dirty underwear!” “It’s all I could find in a hurry,” Sebastian apologized. “Oh, man! I was nose deep in your nasty skid-marks! Sick!” “You’ll live. Besides, it’ll give me something to rag you about for the rest of your life.” “Oh, man . . .” said James, tossing the bloody underwear off the side of the cliff. “I can’t believe you gave me that!” “How’s your nose?” James gently pinched the bridge of his nose and wiggled it. “It’s not broken,” he said. “What about you?” Sebastian massaged his shoulder and shrugged a couple times. “I hurt my shoulder. But it seems okay. Probably gonna have one hell of a bruise.” After a brief respite to calm their nerves, the brothers resumed their descent. This time Sebastian took point.